Charlotte, N.C. -- Last weekend in Charlotte was bigger than ever. 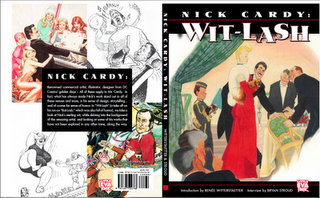 What a great place to debut our new book "Nick Cardy: Wit-Lash," with Nick in attendance. I didn't get to spend nearly enough time with him, but it was wonderful to see the turn out for the show's 30th anniversary, and to see the lines of fans waiting to get their books signed by Nick. Last year we debuted "Nick Cardy: The Artist at War," a book that explored Nick's sketches from World War II, serving as a document of one man's journey through the war as told through his work. "Wit-Lash" is a different kind of book, a 360 you might say, as we look at Nick's humor work. My plan is to follow this one up with a book next year delving into his "girl" art. If you are interested in ordering "Wit-Lash" contact me at: evaink@aol.com for details. The books are also available via Diamond Comics Distributors and at a comic shop near you, hopefully. In the meantime, here is a little on the introduction from "Wit-Lash." There was a book out a few years ago featuring the newspaper work of Nick Cardy entitled "Nick Cardy: Comic Strips" -- One of several great tomes out there on this wonderful artist. For this particular book, however, Nick always jokes that he wishes they'd called it simply "Nick Cardy Strips." It's funnier. You see, he had some specific ideas for the cover: A sketch of himself in his birthday suit, a banner across his mid-section in the necessary places, featuring the name of the book across the sash. Get it? I think he regrets not doing that. "It would have been hilarious," he says. "And on the back we could have a sketch of a pretty girl, with a sign saying 'the end,' because of course her backside is prettier than mine." You really have to listen to Nick. He has this knack of slipping in the one-liners when you aren't looking. He could have been on Vaudeville, I tell you. And like that great comedian and commentator on life, Will Rogers, he's probably never meet a man he didn't like either… or at least hasn't given a chance. Nick has a wonderful Esprit de corps. And we are ALL part of that corps. I first met Nick at the Heroes Charlotte show some years ago. One of the artists that I was agenting was making an appearance there, and Nick came over to the table to talk with him, complimenting him on his work, totally interested in what he was doing and why and how. They ended up exchanging books. My friend was so honored for the kind words, and mentions Nick often to this day. Mostly because he had the feeling that Nick "cared and got what he was doing with his work." In subsequent years, I've seen Nick do this on half a dozen occasions--Take the time to see what others are achieving, and complimenting their efforts. It means a lot, really, for those that came after his groundbreaking works, to be embraced so by this humble man. One of artist Michael Golden's most prized possessions is in fact, a sketch of BatLash by Nick, that I commissioned for Michael's birthday. It's the only piece by another artist that he owns. He often laments that back in his heyday, other artists would never tell him that his work was "good." Would never even comment on it. "Editors in particular would never say a kind word," laughs Nick. "They were afraid you'd ask for a raise." Nick makes up for that kind of silence today. We could all emulate him. His attitude with other artists is that they all soldiers in the same trenches he's trudged through himself. I really became friends with Nick at the Baltimore ComicCon circa 2007 when he was honored with a much deserved "Lifetime Achievement Award" at the Harvey Awards. As he came to the stage, Nick, for the first time in his life was near speechless… I say near… he still rose to the occasion. Again with wit and wisdom. Later, I passed him as he sat in one of the lobby chairs, having a rare drink. I sat in the chair next to him, began talking, and before you know it, the time was half passed two in the morning! Nick has stories to tell-- I know first hand--and the punchlines are always either hilarious, thought provoking, or eye-popping. He often apologizes for talking my ear off…He need never apologize. I was a willing listener. And It was a memorable night--One of my favorite in my career in comics--the reason I made it a mission to document some of Nick's being in these books. One of the things I love about Nick Cardy is his ability to find the lighter side in everything, from the staccatos of humor, juxtaposed against horror during his time in the war--which he relates in our book "Nick Cardy: The Artist at War," to his real life trials and artistic efforts, and most evident to us, in his enduring work. You may know Nick best as the cover artist that helped make DC Comics great. Or the interior penciler who brought classic stories to life such as "BatLash" and "Aquaman" and "Teen Titans" and "Tarzan." And I guarantee you, that if you look at those covers and those stories, you'll find the little bits of humor there, stuck in as he could, being the outfitter of those worlds. I call it The Nick Cardy Stamp, probably put in most often to not only entertain the reader, but to entertain himself. As such, Nick was a perfect choice for many humor related projects throughout his career outside of comics as well-- movie posters for "The Bad News Bears," caricatures of "All in the Family," Lizza, George C. Scott, work for "Crazy" magazine. So many things. In this book, "Nick Cardy: Wit-Lash," we wanted to take a look at that lighter side of Nick's work, featuring spot illustrations, posters, political cartoons, caricatures, magazine covers and ideas for his unpublished newspaper strip "Mr. Figg," which are some of my favorites. In short, we hope you have a laugh. Nick would like nothing better. Oklahoma City--- As the basketball showdown features the battle of the "weathers" across the street, SoonerCon in OKC, heats up with a thunder as well, with the addition of renowned creator Michael Golden as the "Artist Guest of Honor," June 15th-17th! 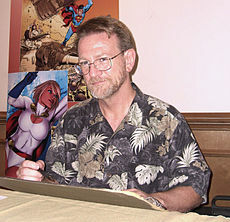 Artist/writer/creator Michael Golden, co-creator of the X-men's Rogue character, Spartan X and Bucky O'Hare is known worldwide for his groundbreaking work on "The 'Nam," "Micronauts," "G.I. Joe Yearbook," and "Dr. 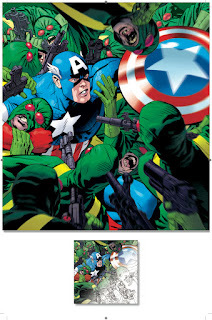 Strange, " among MUCH more, and is counted as one of the best cover designers and storytellers in the business. Recent books covering the colorful life and amazing art of Michael Golden include a Manga version of the "Bucky O'Hare" series, created with Hama, as well as the top selling art retrospective "Excess: The Art of Michael Golden," written by Renee Witterstaetter, which sold out and has gone into a second printing, as well as his recent sketchbooks "Heroes and Villains," and "MORE Heroes and Villains." His new book is entitled "Michael Golden: Alchemy," due out in time for the San Diego Comic Con. 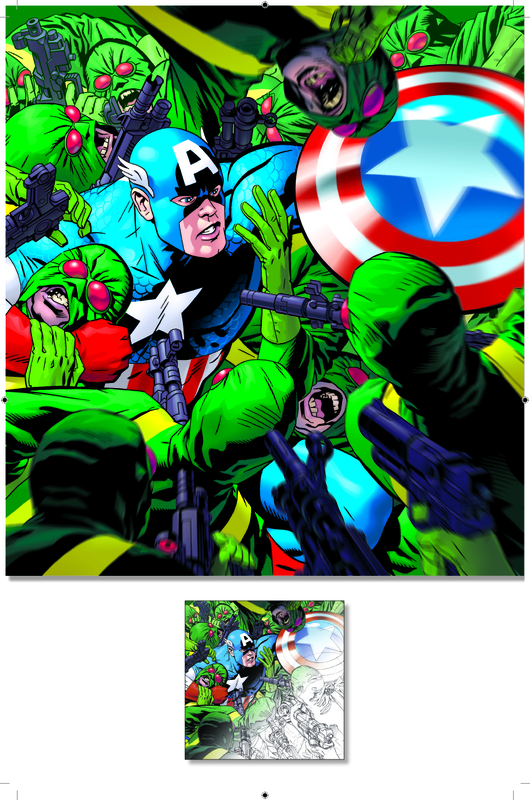 Recently honored with a life-time achievement award from the University of Maryland Eastern Shore as well as the Lille Comics Festival, Michael has served as an Editor at DC Comics as well as Senior Art Director at Marvel Comics, and has worked on scores of movie production projects. His art has been the focus of gallery shows in places as diverse as Gijon, Barcelona, New York, Antwerp and Brussels, while his class on storytelling has been conducted from Spain to Brussels to France to Canada to the United States... and most recently China.